Teachers and Librarians and Authors, Oh My! 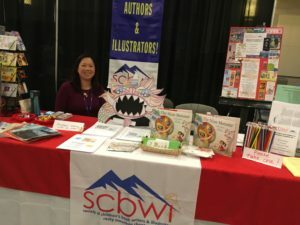 This past weekend, I had the privilege of running three incredible events for the Rocky Mountain Chapter of the Society of Children’s Book Writers and Illustrators. My position on our board of directors is called, “PAL Liaison,” which means I connect traditionally published authors and illustrators with teachers, librarians, booksellers, parents, and of course, children. 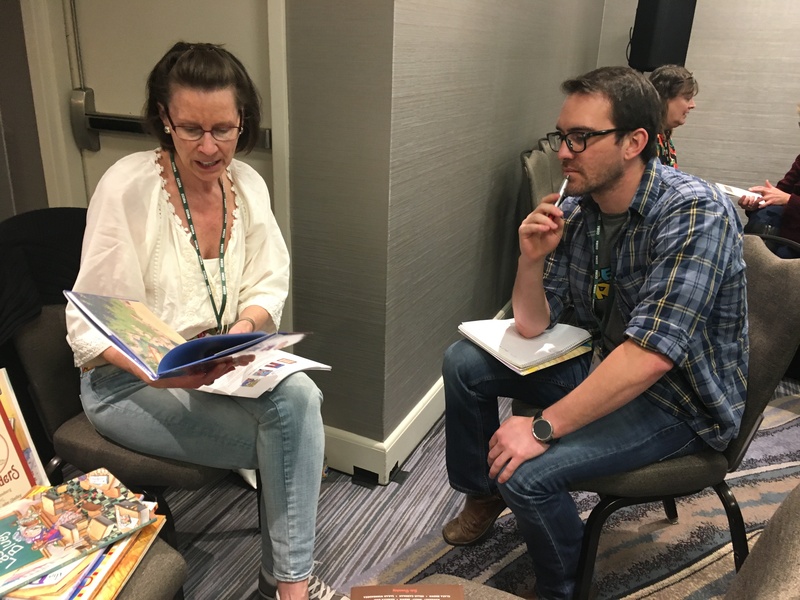 It was a joy to see our SCBWI PAL (published and listed) members share their passion with the people who love their books. 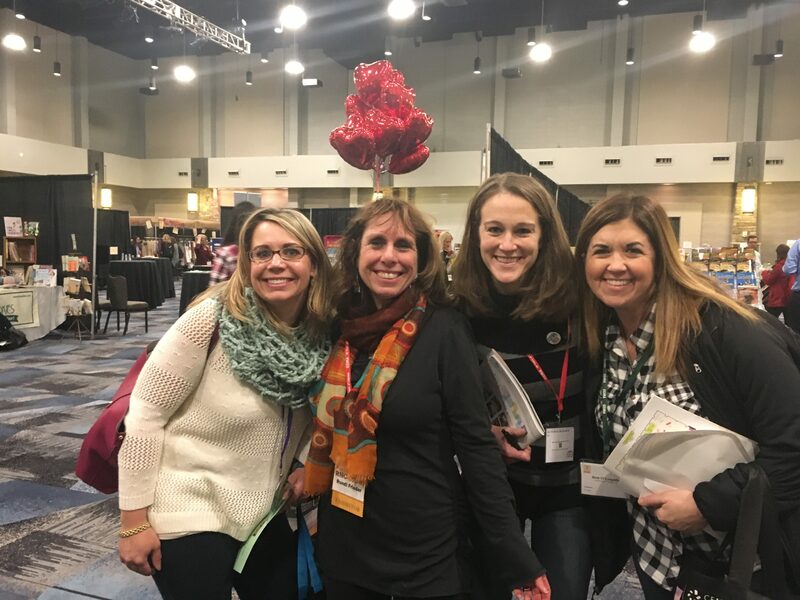 For many years, I attended this conference as one of those teachers. I met Kate DiCamillo, Will Hobbs, and Lois Lowry at this very same venue. 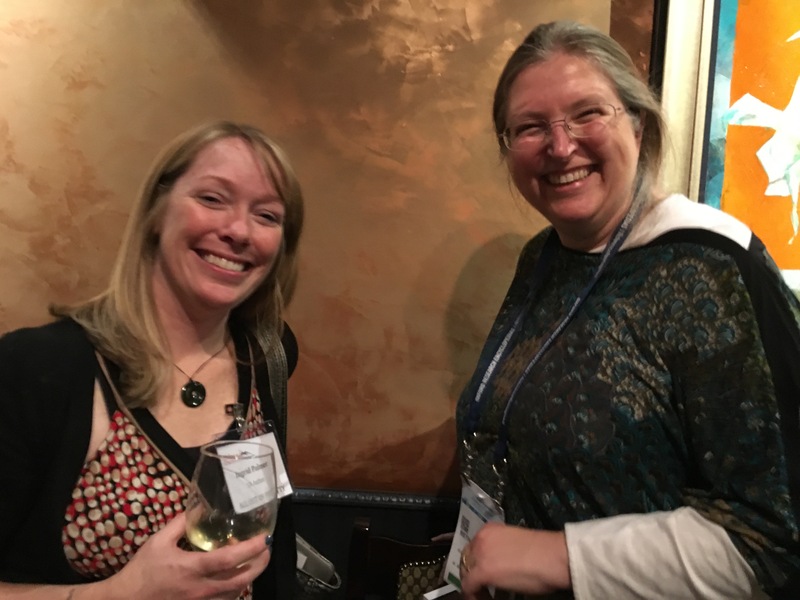 I was totally star struck when I had the opportunity to be in the company of these literary rock stars! This weekend, I am happy to report that we had our own share of squeals and howls as teachers won door prizes, took photos with our authors and illustrators, and went away with pencils, hand-painted rocks, and gobs of stickers. Yippee! My next program was leading a “Speed Dating” session with authors, illustrators, and educators. 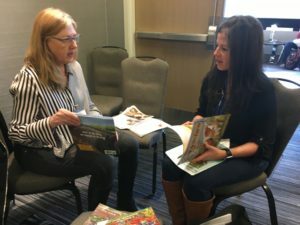 There were eleven stations set up around the room which enabled our authors and illustrators to spend quality “one-on-one” time with teachers and librarians. Some attendees wanted to know how to write for children. 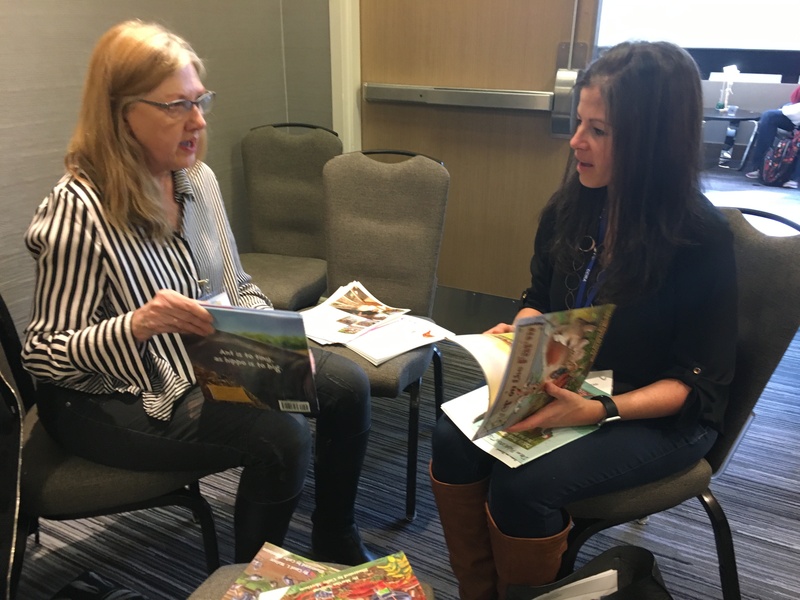 Others were interested in learning more about using specific books in their classrooms. No two conversations were alike. This went on for eight minutes until it was time for the next date. The only problem I had was moving the participants on to the next chair. Everyone was so engaged and animated! At one point, the chatting became so loud, other conference attendees began poking their heads into our room to see what was going on. They smiled and nodded when they saw our rollicking book party! It was so much fun that one teacher asked if we could do this next year as an exclusive luncheon. It certainly is something to consider. 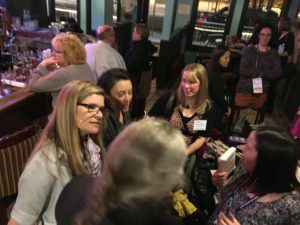 For my third act, I hosted a happy hour “meet and greet” in downtown Denver for authors and librarians. 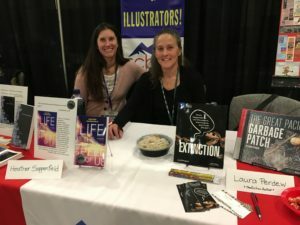 As luck would have it, the American Library Association (ALA) was holding its mid-winter conference at the Colorado Convention Center this same weekend. 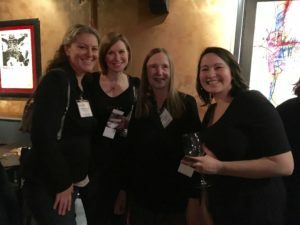 Despite frigid weather and blowing snow, a dozen of us made our way down to the Greedy Hamster on Saturday night for appetizers and drinks with a group of friendly YALSA (Young Adult Library Services Association) librarians from around the country. Many of our debut authors got to experience the thrill of giving away pre-released books to these lucky book lovers. Huzzah! 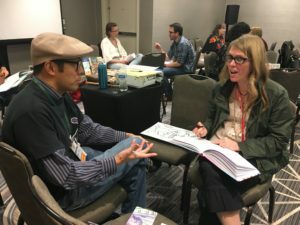 Connecting authors and illustrators with their adoring fans is definitely the best job in the world. I can’t wait for our next event! It is a perfect day for writing. I have characters impatient to move forward, ready to endure things getting a little worse before they get better. My plot is waiting to advance and my characters are growing and changing, all according to the outline that I hammered out months ago. Two people I created are literally trapped in a tree and the person they are hiding from is striding toward them. They need me. 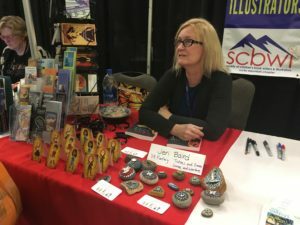 So why can’t I write? 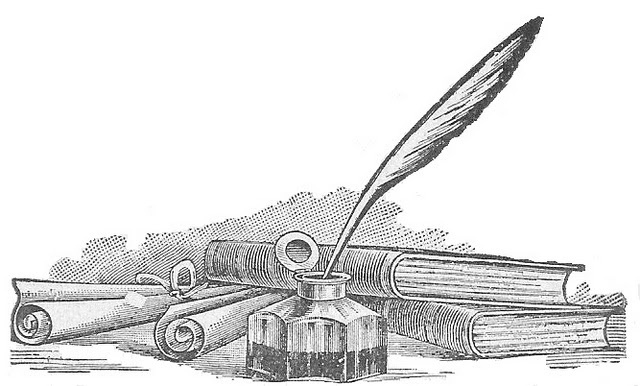 I keep trying, but every time I sit down to write, I come up blank. I write a sentence or two and it seems so… wrong somehow. I think back to the way the story flowed out of me in the beginning, the characters putting on their personalities like layers of clothes, filling out and surprising me with their actions and words. It was fun and exciting. I anticipated my writing time, eager to watch how the story I wanted to tell would find its way into the world. But now, my frightened characters hide in the branches. I need to write the words get them out of this chapter and into the next. But there they wait, feeling confused and abandoned. I know them and they are very, very disappointed in me. Looking for answers, I decided to survey what some of my favorite authors had to say about writer’s block. They provided interesting and sometimes contradictory advice, but I was buoyed by the wisdom that their words spoke to me. Lesson from Hilary: It’s okay to take a break and to wait for the right way to tell the story to come to me. Plus, it’s fine to find some time to bake that pie. Oh… and scowling does not help. Lesson from Orson Scott: I need to pay attention to what I have written and analyze if it feels true. If not, I’ll need to change it and make it both believable and interesting in order to move forward. My unconscious mind will be telling me things my conscious mind does not know. Lesson from Margaret: My book is not going to arrive perfectly, so obsessing about each word or sentence is counterproductive. I can revise a bit as I go, but I can always go back and change everything if I wish. My first draft is just one part of the process and I need to get it down from beginning to end, then see about moving it closer to perfect. Lesson from Maya: Some of what I write will be boring and awful. But that “the muse” is waiting and inspiration will come when I am ready for it…or when it is ready for me. Lesson from Jeff: I need to trust the story and allow myself to veer from my plan if something isn’t quite right. I need to let go of some things, things that seemed important and essential at one time, and leave it out if it doesn’t belong any more. Lesson from Barbara: I need to make sure that the book is my own, not what I think other people want the book to be. My book is historical fiction for children; I worry about making it marketable, politically correct, and always age appropriate. I need to set aside those worries for now and just tell the story. Lesson from Samuel: I shouldn’t be overwhelmed by the entirety of the book, but just move forward one incident at a time. If that is how he got that fence whitewashed and Huck to his own funeral, I can get those characters out of the tree. Lesson from Warren Ellis: I’ve never read anything by Warren Ellis, in fact I’ve never heard of Warren Ellis, but I appreciated what he had to say. I probably just need to get over myself and just write the @#$%$#ing book.